Off Peak Rates Per Week Listed Below.... Great Values! 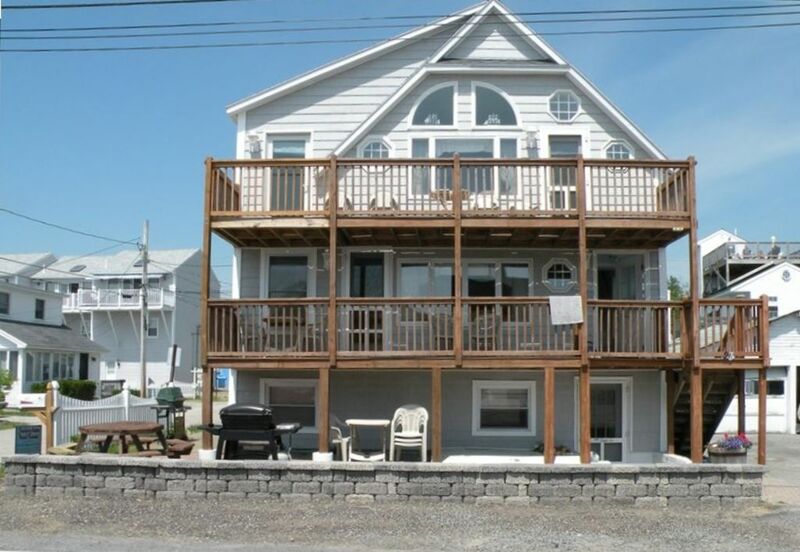 Beautiful 3 floor summer vacation paradise and only one house back from the beach. Each floor has a kitchen, 2 bedrooms, 3/4 bath and is modern & roomy. Actual address is: 23 Puffin Street Old Orchard Beach, Maine (Aprox. 1/2 mile from pier area )House is only 15 minutes from Kennebunkport and Portland downtown, 1/2 hour from Freeport. 'Lighthouse' Top floor.... Awesome ocean views, two new bedrooms(one with full & one with full & two twins), and queen sleep sofa sleeps 8. Has best views and outside deck. Master bedroom has a glass door to the outside deck. 'Sea View' Middle floor....Roomy with ocean views, two bedrooms (one queen, one full, two twins), day bed with trundle, sleeps 8. Also large outside deck. 'Snugglers Cove' Bottom floor, cozy atmospere, two bedrooms, (two full, three twins), outside patio area, sleeps 7. This unique property can be rented as one huge family get away or each floor individually. Send us an email if you want details on the individual units. Property has been totally renovated inside and out and is gorgeous. Hardwood floors on every level, plenty of glass, all appliances, fully stocked with cookware in kitchens. Beach house is last on a dead end street with little to no traffic and very quiet. Each floor is allowed TWO parking spaces. This sandy beach is 90' away!! All floors are completely furnished, including coffee maker, microwave, cookware, BBQ grill, TV/DVD/VCR/cable, bed linens must be arranged at time of reservation if desired. The 2nd and 3rd floors have large outside decks with the 1st floor has a nice outside sitting area. On site coin-op washer and dryer. Amusement parks, restaurants, shopping, old fashioned drive in, water parks, and of course.....The famous Old Orchard Beach pier all within 10 min walk to 10 min drive! For more information please see our website at somainebeachrentals. com for more information and availablity. Beautiful ocean views, quiet beach but close enough to walk. Each unit has a full kitchen. New flat screen tv's with built-in DVD players for 2010! First floor unit has patio. Second and Third floor units have decks. Parking for two vehicles per unit, Blankets and Pillows are provided.